John Van Buiten, 96, of 102 Westervelt Ave., died early today at home after a lengthy illness. He resided with his daughter, Mrs. George (Grace) Trouwhorst. Born in the Netherlands, he came to this country in 1888 and lived in Prospect Park for most of his life before coming to Hawthorne. He was the widower of Mrs. Gertrude Udes van Buiten. Mr. Van Buiten was a building contractor, having build hundreds of homes and commercial buildings in Paterson, Prospect Park and Hawthorne. He constructed the mills occupied by Century Woven Label Company in Prospect Park. He was a member of the Borough Council of Prospect Park for many years, and was a pioneer in the town's sewer construction. Mr. Van Buiten served as a Prospect Park fire chief during the time the mills he constructed burned down. He was in charge of reconstruction of the mills. 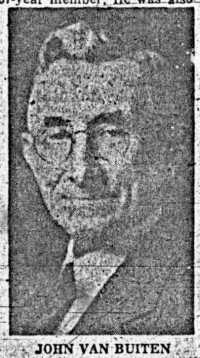 He was a member of the Board of Education in Prospect Park, and was a founder of the present elementary school there. He was also a member of the Exempt Firemen's Association of Prospect Park, the Eastern Academy School Board, treasurer of the Academy, and a board member of the Holland Home of Paterson, now located in North Haledon. He served the home as financial secretary for many years. Mr. Van Buiten was the second oldest member of the First Christian Reformed Church of Haledon, where he had been a 57-year member. He was also a real estate and insurance broker. Services will be held Friday in the Vermeulen Memorial Home, 131 Haledon Ave., Paterson, with the Rev. N. Robert Prins, pastor of the First Christian Reformed Church officiating. Interment will be in Fair Lawn Memorial Cemetery. [S14] Pat. Eve. News, Jun 8, 1965, pg 41. [S32] Telegraaf, Feb 13, 1918, pg. 4. [S5] 1910 Federal Census, John Van Benten, 26 Apr 1910. T624 Roll: 907 Page: 33, ED 163. [S7] 1920 Federal Census, John vanBuiten, 9 Jan 1920. T625 Roll: 1066 Page: 142, ED 154.